MANAGUA, Nicaragua (AP) — President Daniel Ortega’s government announced it held talks on restarting a long-stalled dialogue following political violence that left more than 300 dead last year, but the proposal was swiftly met with a raft of preconditions from opposition groups and civil society Sunday. The government said late Saturday that it had an “exchange” with a group of private businesspeople in the presence of two Roman Catholic Church figures on resuming talks over matters important to the country. “The need for an understanding to begin a negotiation was confirmed, through an inclusive, serious and frank encounter,” the official statement said. It did not identify those who took part from the business sector, but said Cardinal Leopoldo Brenes and Apostolic Nuncio Waldemar Stanislaw Sommertag attended. The Archdiocese of Managua confirmed the encounter. Brenes said Ortega and Rosario Murillo, Ortega’s powerful vice president and first lady, participated, along with business magnate Carlos Pellas and representatives of two private banks. Government opponents said they were open to talks but set preconditions including the release of more than 700 people they consider “political prisoners,” complete freedom for the media and demonstrations, and the disbanding of armed, pro-government militias that partnered with security forces in last year’s deadly crackdown on protesters who were demanding Ortega leave office. The government has shuttered some media outlets and non-governmental organizations, arrested some journalists and effectively barred anti-Ortega protests. The unrest began last April as protests against a social security overhaul that would have lowered benefits and raised taxes on workers and employers, but amid the heavy-handed crackdown the protests expanded in scope and scale. Talks on ending the dispute were begun May 16 and suspended July 9 with no true progress. Ortega’s opponents demanded he leave office and for elections scheduled for 2021 to be held early. The government rejected both, and instead quashed the protests by force. In recent days the government affirmed that the elections will take place as scheduled in 2021. 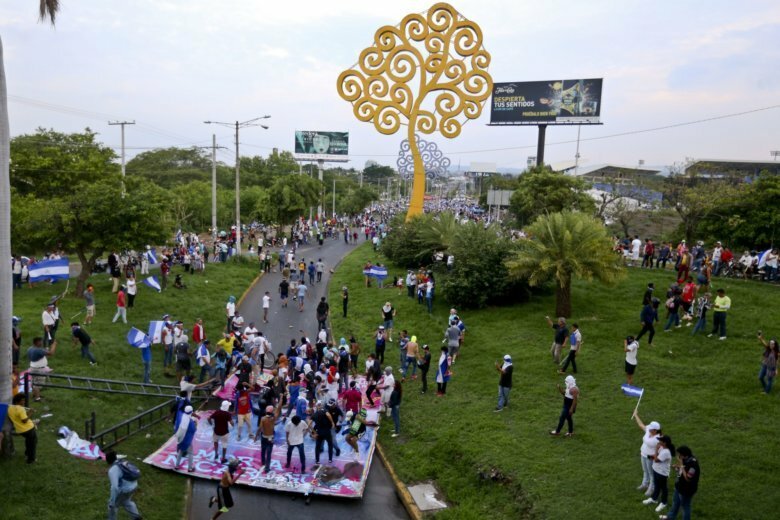 The political crisis has battered the economy in Nicaragua, already one of the poorest countries in the region, particularly in tourism, commerce, infrastructure and investment. GDP contracted 4 percent last year, according to the World Bank, after years of averaging annual growth of about 4.5 percent. An estimated 50,000 Nicaraguans have fled the country. The opposition Sandinista Renewal Movement called for guarantees for exiles to come home and for the return of property and equipment seized from NGOs and media outlets.